Turkey Time & Talk - AGAIN!! Cheers Everyone and "Happy Holidays"!! I know, I can't believe the holidays are here either! And with the holiday season now here, our focus on food and wine and their delicious pairings is enhanced and increased even more! Also each holiday season I am often asked by friends and associates about frying a turkey and all the prep, cooking guidelines and wine pairing related to it. So with that in mind, I thought it would be fun to repost my "Turkey Talk" blog post from November of 2014. Its a fun and comprehensive overview of how to safely prep your bird as well as fry it safely. So "happy frying" and here's to a great holiday season!! Look for my December holiday post early next month! Cheers!! OK... Thanksgiving and the holiday season are happily now upon us! I so love the holidays with their traditions, decorations, celebrations, and of course foods and wines!! So, with the holidays in mind, lets "Talk Turkey"! As many of you know I have enjoyed deep frying turkeys for many years. Whether for our traditional Thanksgiving dinner, Christmas parties, my Fire Department friends, or simply because we are in a fried turkey mood, frying a turkey is one of my very favorite culinary creations! Not only, in my humble opinion, is deep fried turkey one of the moistest and more flavorful methods to prepare your "holiday bird", but the prepping and cooking process is something I enjoy almost as much as tasting the finished fried turkey itself! Each year as the turkey fries and I stand "at the watch" of my bird, friends and family seem to be drawn to and around the boiling pot admiring its sounds, sights and aromas. For me, so many wonderful conversations, stories, great times and memories have been experienced and made during this very special and traditional culinary event. So with Thanksgiving and the holiday season right around the corner, I thought it would be fun to blog my thoughts, opinions, techniques and recipe for "The Big Dog's Deep Fried Turkey"!! I want to begin by separating our "Turkey Talk" into three parts: Safety, Preparation and Cooking. First lets talk safety. Each holiday season I am amazed and even saddened to hear of news reports of enthusiastic but misguided "fowl fryers" who, by using improper frying locations, preparations and frying techniques and practices ignite their fryers and in some cases ignite their decks and structures as well! Three years ago I was astonished to hear a news report of a local Tennessee town's Fire Chief who actually burned down his entire home's deck by improperly frying his Thanksgiving Turkey! Crazy!! Of course by following some very simple and easy preparations and cooking guidelines, your holiday turkey can and will be a fun, festive and very safe holiday experience! Your turkey fryer should always be located in a clear open area. Never operate your fryer on your deck, in a garage or carport, on a front porch or near any structure. Make sure that trees are not over hanging your frying area and that you place your fryer on a driveway or other clear surface and area and away from tall grass and bushes. Also, the "frying area" is not a recommended place for small children or even pets. Accidents can happen and running and playing around a pot of 350 degree oil is not a good idea. Use only approved well maintained deep fryers with deep pot, food stand or basket, a handle to lower your bird and a accurate long stemmed thermometer / temperature gauge. Also, I recommend using an oven mitt when lowering and removing your turkey. Your oil will be boiling and your mitt will prevent any oil from possibly "popping up" and landing on your hand. Also, always have a top for your frying pot close by and of course an approved fire extinguisher. While very unlikely to ever need either, if your fryer ever does happen to ignite, the only real way to extinguish the flame is to cut the gas off to cool the oil and cover the pot to cut off the flames oxygen source. This will take a while so ignore the temptation to uncover the pot and see what's happening. Uncovering the pot will simply add oxygen to the pot and reignite the oil. As for the oil. I like to use peanut oil for my deep frying. While I know some who use other oils, in addition to peanut oils fantastic frying environment and flavor it provides, it also possesses a higher "smoke temperature" as well. It is important to make sure that your turkey is completely thawed! There should be no ice in the cavity and your turkey should be 100% thawed. With your turkey thawed and seasoned, I will take my turkey out of the refrigerator and sit out for around thirty minutes before I ease it into the oil. This will help during the initial frying process and cause less oil "agitation" when lowering your bird into the oil. Preparations for frying a delicious holiday turkey should ideally begin 24 hours before your ready to "drop your bird". For the best and most tasty results, you should completely season, and if so desired, inject your turkey the night before you plan to fry it in order to let the seasoning "work it's mojo"! Now some enjoying brining their turkey (there are many great brine recipes for turkeys), for 24 to 36 hours and then frying it. However for me, I prefer a great seasoning rub and injecting. As for seasoning, there are countless rub and injecting recipes for seasoning your turkey. As for me, I enjoy using a very simple but very flavorful seasoning routine. First, after rinsing and patting dry my turkey, I place it in a large aluminum tray and lightly drizzle and coat the bird with my favorite olive oil. Next I generously season and rub the entire turkey, both inside and out with Tony Chachere's Creole Seasoning. As I said earlier, there are many outstanding seasoning and rub recipes that will work great for fried turkey. However for me, I simply enjoy the Creole and Cajun spices and flavors Tony's seasoning brings to my bird! Next after completely seasoning my turkey, I do prefer to inject it as well. While some chefs enjoy injecting their turkey with prepared "over the counter" injectable seasonings, I prefer to simply inject my turkey with a wonderful Black Dog Cellars Haney Family Estate Russian River Valley Chardonnay. 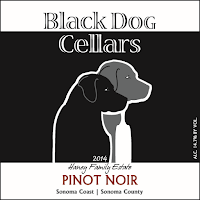 Of course Black Dog Cellars is my Chardonnay of choice but feel free to use one of your favorites as well. And since you will only be using a quarter or so of the bottle for the injection process, you will have plenty to enjoy as your turkey preparations and evening continues! Trust me I do!! Now the Chardonnay serves to enhance and give additional moisture to the turkey. For me my Tony's seasoning brings all the Creole and Cajun flavors my turkey needs. Now as for how much and where to inject your bird, I simply cover all the main areas of the turkey. Usually I will make 6 or so injections (3 on each side) in the breast area, 2 injections each for the legs, and 4 on the underside of the turkey. Use an approved injector (you can find these at any kitchen store) and don't be afraid to inject a nice injection of Chardonnay into each area. However don't drown your turkey either. Say about 1 or so teaspoons with each injection. So now with your turkey all "prepped up", simply cover it with foil, place it in the refrigerator until your ready to prepare to fry it and enjoy that glass of Chardonnay!! So your now ready to "drop your bird" and begin to fry! Ok then, your turkey should be completely thawed and all seasoned up! Also as I mentioned earlier, take your turkey out of the refrigerator and let it sit for 30 minutes or so. As your turkey sits out, begin to get your frying oil ready and up to temperature. It's always about now that someone will ask me "so how much peanut oil do I need to pour into the frying pot"? Good question! We want to avoid having the hot oil spill out and over the pot while we are lowering the turkey and while it is frying. However we also need the entire turkey submerged in the oil during the frying process. Well figuring out just how much oil you need is actually really simple! The exact amount of oil needed can vary from turkey to turkey based on the bird's size. So here is a quick and easy trick to remember that will help you pour the exact amount of oil into your frying pot. Of course as you cook turkeys again and again, you will soon learn the exact amount of oil needed. So before seasoning and with your turkey still in its original wrapping, simply lower the bird into your empty frying pot. Next begin to fill the pot with water until your turkey is completely covered in water. Once covered in water, remove your turkey from the pot and return to the refrigerator. The amount of water that is left in the pot should be close to the level of oil needed to completely submerge your turkey for frying! If needed, make a small mark on your pot to indicate your needed frying oil level and your all set. Nothing to it! Once you have poured your oil to the desired level in your frying pot, we need to begin to heat the oil to the desired frying temperature. Light your fryer using the approved manufacturers techniques and once ignited, set burner intensity to a medium high setting and then sit your pot of oil onto the fryer. Now for a little more fun. As you begin to heat up your oil, I like to infuse my frying oil during this time with a little rosemary and garlic!! Simply add a few sprigs of fresh rosemary and a handful of fresh garlic gloves to your oil and let them work their magic on the oil as it comes up to temperature! As your oil is now heating up and infusing with the fresh rosemary and garlic, it's time to place your turkey on the frying stand or in the frying basket. Position your turkey with legs up and place it on the stand or in your basket. Now you are almost ready! Ideal frying temperature for your turkey is around 350 degrees. Now here's a hint... once you lower your turkey into the oil, the temperature of the oil will go down. So I like to preheat my frying oil to around 355 to 360 degrees. So once the turkey is in the oil, your frying oil temperature will be close to a constant 350 degrees. However, as frying continues, make sure to keep a close watch on your cooking temperature and make slight adjustments to the burner intensity as needed. Make sure your temperature does not dramatically exceed 350 degrees! Also if needed you can add a few minutes to your cooking time if your oil stays below 350 degrees for a while. With your oil now preheated to the desired degrees, use a long spoon or grill tongs to remove the rosemary and garlic before you lower your turkey into the oil. Now place your oven mitt on the hand you plan to lower your turkey into the oil and attach the approved handle to the frying stand which your turkey is now on or grasp the basket handle that was included with your fryer. Standing back from the fryer and extending your arm, SLOWLY begin to lower your turkey into the oil. You can even stop lowering your bird to let the oil calm down a bit as well as flow into the cavity of your turkey. Once you have lowered the turkey completely into the oil, disconnect the handle from the stand or release the basket handle and enjoy! You are now frying your turkey!!! As for how long to fry your turkey, here is a simple formula to follow. Fry your turkey 3 1/2 minutes for each pound your turkey weighs. For example, if your turkey weighs 15 pounds, then fry your turkey approximately 52 1/2 to 53 minutes. I usually fry my turkeys and extra minute or so just to make sure all is done. especially if my cooking temperature was slightly lower than desired. As your turkey fries, enjoy your family and friends as they gather round the fryer, enjoying a nice glass of wine and "Talking Turkey"! Now once your desired frying time is completed, it's time to remove your turkey from the oil. Again cover your hand with your oven mitt and carry a simple cookie sheet along with your frying stand handle to your fryer. First, turn off your frying burner. Then attach handle to the frying stand or grasp the frying basket handle and slowly remove the turkey from the oil. As you bring your bird up, go slow and let some excess oil drain from your turkey. Once up and as you hold your turkey by the handle, place the cookie sheet under the turkey stand to prevent oil from dripping onto your floor as your bring your turkey inside. Once inside, place your turkey (still on the stand or in the basket) on a wooden cutting board to begin to rest. Let your turkey rest a minimum of 20 minutes before removing it from the stand, placing it on your serving platter and beginning to carve. Now while everyone is admiring your work and your turkey is resting, make sure your oil is once again tuned off and you again inform guests to stay clear of the fryer. It will be hot for a while after it's turned off. Congratulations!!! You have just fried a delicious turkey!! Now lets talk about another of my very favorite topics... Wine!! As for pairing wines with your traditional holiday turkey dinner, there are a number of thoughts and directions one can take. However for "The Big Dog", here are my recommendations and ideas! To start off Thanksgiving Day and get the festivities underway here at our house, we like to begin with a little Champagne or of course "Breakfast Chardonnay"!! Then as the day progresses we love a fantastic glass of Rose`!! I personally think Rose` is a wonderful Thanksgiving and holiday wine!! Then with our Thanksgiving and holiday turkey dinners, we again enjoy Champagne, Riesling and of course in our home, Pinot Noir and Zinfandel! Now that is a great way to compliment the perfect fried turkey!! So there you have it!! I hope you enjoyed my "Turkey Talk" blog post as much as I did posting it!! Please let me know your recipes, experiences and ideas for your turkey, holiday dinners and parties. Also let me know of your wonderful wine experiences and pairings as well this holiday season!! Thanks again everyone and here's to a fantastic and delicious holiday season!! "The Big Dog's Blog". However look for much more regular updates and posts to my blog in the coming months! So... like my 2014 harvest report, I thought I would deliver this new harvest report post by giving you a brief overall summary of my thoughts from this years 2015 harvest. While those of you who remember our 2014 harvest report, 2014 was one of the earliest grape harvests reported on record. However this years 2015 Sonoma County grape harvest began even earlier than the 2014 early harvest. For the second vintage in a row, in general, growers reported that this years 2015 harvest was on average even earlier than 2014. In some cases growers reported beginning harvest almost two weeks earlier than 2014 making this years 2015 harvests possibly one of the earliest grape harvests in memory for Sonoma County. And also like 2014, growers had to deal with California's continued record setting drought, as well as, a warm winter, cooler Spring and a couple of Summer heat spikes this year that helped contribute to this years early harvest times. After talking to some of the most respected grape growers, vineyard managers and winemakers across Sonoma County, consensus is that grape yields across the county this year are down an estimated 15 to 40 percent on average. However it is significant to remember that this figure also uses the excellent harvest numbers of vintages 2012, 2013, 2014 as a comparison as well. In addition, the 2015 harvest came "fast and furious" for many growers with vineyards across the county not only ready for harvest early, but many at the same time! This required growers and winemakers to put in even longer hours than normal during the busy harvest season. However while grape yields and weight are down for 2015, growers and winemakers are extremely excited and enthusiastic about the 2015 vintage fruit quality! Grape concentration and richness is fantastic and speaking from "The Big Dog's" personal experience in the vineyard this harvest season, the intensity and flavors for the 2015 vintage are truly amazing!! So while yields and quantity may be down for 2015, the vintages quality, intensity and flavors are classic! I can't wait! Finally I want to once again salute all those amazing grape growers, vineyard managers, winemakers, harvest crews and winery staffs that work long early hours each harvest season to make some of the worlds greatest wines!! Cheers to you all!! 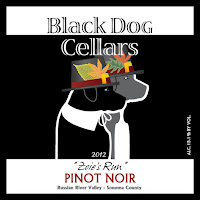 Check back in November for the start of my "Big Dog's Blog" holiday blog posts!! "The "Big Dog's" Annual Harvest Report"
One of my very favorite seasons and time of the year is now upon us in California! 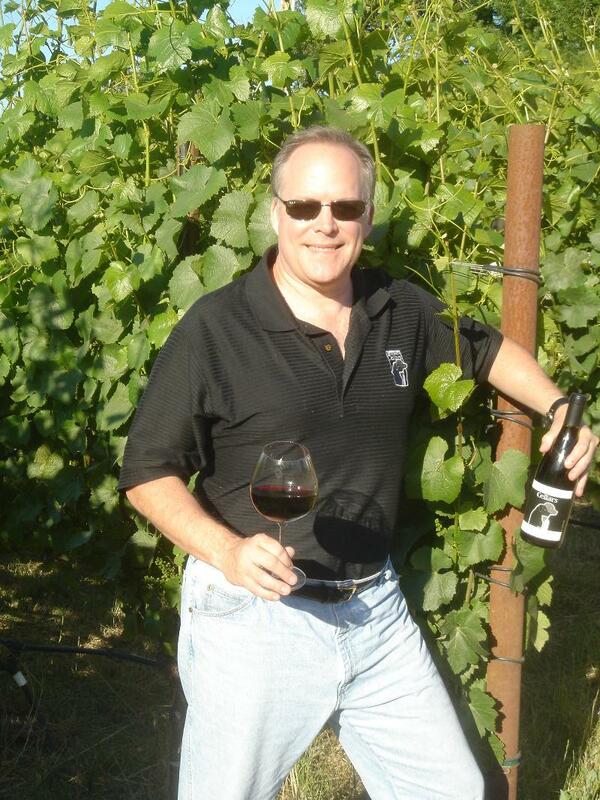 The 2014 harvest in beautiful Sonoma County and Napa Valley is currently in full swing! With this years harvest being one of the earliest on record, coupled with the "shaky start" some of our winery friends experienced due to Mother Nature's recent earthquake, this years beginning to the harvest season has been a bit unusual. However, as determined, passionate and industrious as grape growers and wine producers are, they took these unusual developments in stride, cleaned up after the earthquake and began to, like each and every year, begin their amazing work of harvesting some of the worlds greatest wine grapes. As I stated earlier, this years harvest is one of the earliest on record. In general, growers are reporting that this years harvest schedule is on average at least two weeks ahead of years past. In addition, growers had to deal with a hot, dry Summer in the vineyards this year that helped contribute to this years early harvest times. However, at this initial stage of harvest I am very happy to report that most growers and winemakers I have talked to all confirmed that the quality of the 2014 fruit is excellent with yields looking to come in slightly above average but not to the big tonnage recorded in 2013. While some vineyards are reporting slight signs of stress in some of their vines due to the dry conditions, grape quality, like the 2012 and 2013 vintages, is also expected to be outstanding for this years harvest! This will give California three consecutive excellent grape quality harvests coming off the challenging 2010 and 2011 vintages. On a personal note, after walking numerous vineyards and assisting with multiple vineyard harvests already this season, I can report that fruit quality looks excellent this year with healthy ripe grapes and outstanding flavors! I am very excited about the 2014 vintage and believe at this early stage it will be another wonderful and flavorful vintage in both Sonoma County and the Napa Valley! So now, as I previously discussed in this posting, I thought it might be fun and educational to briefly try and describe a few of the elements, environments and work that goes into an average day during harvest season for the grape grower. Trust me, it is not easy but as for me, I love being a small part of harvest season!! Ok... a day in the life of harvest season for the grower and winemaker actually begins days before the specific harvest day. Sampling, testing and tasting the grapes to determine their current state of ripeness and projecting the optimum day and time to pick the vineyard so the grapes are at their maximum flavors. After sampling and testing the fruit, consultations between the growers and winemakers determine a specific vineyards harvest schedule. However, not all vineyards, or even blocks or sections of a vineyard are the same so many blocks or sections may be scheduled on different days due to the levels of ripeness within each vineyard block. Once a harvest date and time is set, coordination with the winery on grape deliveries is accomplished, picking crews are scheduled and equipment such as tractors, grape bins, vineyard lighting, delivery trucks and more are "prepositioned" for the early morning pick to begin. So as you can see, there are actually days of work and planning that go into and are executed BEFORE each and every single day in the life of harvest season grape picking! Today, many of California's finest grape growers and winemakers insist on harvesting their grapes during the cooler early morning hours. The cooler weather conditions are much better for the grapes and helps bring them to the winery at their maximum point of ripeness and flavor. This means most picking times begin around 3:00am or so! Consequently, the early morning darkness can bring another element and challenge to an already demanding job. Harvest can be a physically demanding, mentally stressful, and a very intense and dynamic time! Many vineyards can ripen and be ready to pick at close to the same day and time. Which means growers, winery staff and picking crews may have to operate on limited rest and "down time" for days at a time in order to harvest and process the fruit at it's peak of readiness. In addition, during these "night picks" vineyards can be filled with crews of pickers, moving tractors in close proximity, grape bins and in some vineyard circumstances, challenging terrain and slopes. Not to mention the occasional "critter" that pops up! However, growers and winery staffs take great precautions and emphasize safety at all times during this busy time of year. Many wineries conduct and require attendance from staff and interns at safety classes before harvest season and grape processing begins. In addition, for scheduled "night picks" headlamps and reflective vests are worn by each crew member, crew member duties are orchestrated so picking personnel know where to go and be, and crew foremen are constantly watching out for crew members safety and harvest efficiency. Once the grapes are picked and put into their respective bins, these bins are transported to large trailers or trucks for their trip to the winery for processing. Once at their respective wineries, staff begin the magical process of "grapes to glass"! So there you have it!! Now while this particular brief description of a day in the life of harvest season is based mostly on my own personnel experience and those descriptions from other grower and winemaker friends, it by no means identifies all of the many other details, tasks and circumstances that come into play with each and every vineyard pick. However, I am amazed and inspired each harvest season by the passion, dedication and commitment that grape growers, their crews, and winery staffs demonstrate each year to grow and make some of the worlds greatest wines! The "Big Dog Blog's" and this post is dedicated to all that you do!! Cheers everyone and "Happy Harvest"!!! After taking a break earlier this year from writing and blogging, I'm happy and excited to once again be posting on "The Big Dog's Blog"!!! So check back often for more posts and as always, please include your comments and opinions to my blog as well!!! Now like many of you, my grills are "fired up" year round regardless of the weather and season. (I actually grilled out burgers once in Grayton Beach Florida while a "weak" tropical depression made landfall! I know...a little crazy!). However with Summer in full swing and Labor Day Weekend just around the corner, I thought it would be fun to post about one of my favorite culinary topics... Burgers! Course as many of you know, I love to cook! So grilling out as we say in the south, or as they say in California, barbecuing, whether on the deck, by the pool, in wine country, at camp or for that matter, anywhere with family and friends and all the while enjoying great wines together is simply one of my very favorite fun times and relaxing activities. Over the past many years, I have been blessed and fortunate to cook with and for, as well as, have as good friends some of the greatest chefs and culinary enthusiastic buddies in the world! Their skills, techniques, attitudes and friendship have taught me more than I can express and I have so enjoyed learning and developing so many wonderful new recipes with their outstanding guidance and suggestions. This includes great burgers as well!! So I thought it would be fun this Summer to share one of my favorite burger recipes with you all. While I have quite a few burger recipes, and I enjoy all of them very much, this particular burger is one I have been grilling up this Summer to some wonderful reviews from friends and family. I have named this burger recipe my "E Burger" in honor of my friend and world-class and renown Chef Emeril Lagasse! I have modified a similar burger recipe he developed and added a few favorite ingredients of my own! So... give it a try next time your thinking about burgers and want something a little different!! Hope you enjoy it as much as I do!!! E Burger... By "The Big Dog"
While ingredient amounts will change based on number of burgers prepared, for the purpose of this article, amounts are based on two burgers (I like Big Burgers!). In your favorite frying pan, begin by frying up eight pieces of thick cut bacon on your grill or stove top. Once fried, reserve four pieces for topping the burgers later. Crumble or chop up the remaining bacon and set aside. Chop one medium sized yellow onion and one head / bulb of garlic. Without draining the bacon fat in the pan, add the onion and garlic to the pan and saute for around 5 minutes or until about halfway cooked. Then add the crumbled bacon to the onion and garlic and saute for an additional 2 to 5 minutes, stirring occasionally. Upon completion, drain and set aside to cool slightly. In a mixing bowl, add one pound of good ground chuck, splash of Worcestershire Sauce, couple of pinches of kosher salt and fresh ground pepper, small container (4 to 5 tablespoons) of crumbles feta or sun dried tomato feta cheese AND then the slightly cooled sauteed onion, garlic and bacon mixture. Mix ingredients together and make into two large thick burgers!! Place on a medium hot grill and cook till preferred. About ten minutes a side for medium well burgers. Before burgers are taken off the grill, place two strips of the reserved bacon on each burger and top that with two slices of sharp cheddar cheese on each burger and melt. Once cheese is melted, remove burgers to rest for a few minutes. While burgers are resting, butter your burger bun of choice (I like ciabatta or brioche buns) and toast on the grill. Don't walk away... it wont take long! Once buns are toasted, lets construct our burger!! Place burger on bun and spread a little mayo (or if you prefer your favorite condiments go for it!) on bun. Then top your burger with one slice of tomato and one piece of iceberg lettuce for that great crisp cool crunch!! Now I have to add this little addition... Occasionally I will add a fried egg on top of this burger as well if I'm REALLY hungry but its totally optional!! Now pair with a wonderful Pinot Noir like a 2012 Black Dog Cellars "Zoie's Run" Russian River Valley or a 2012 Black Dog Cellars Haney Family Estate Sonoma Coast Pinot Noir and have a fantastic dinner!!! Cheers and Bon Appetite!!! Hope you enjoy this as much as I do! So if your feeling "burger adventurous", give my "E Burger" a try and see what you think!! Thanks again for stopping by "The Big Dog's Blog"! Look for another new post coming soon and Cheers everyone!!! Well Fall is just around the corner and with September’s arrival, I celebrate one of my favorite months and seasons of the year! While cooler weather is not to far off and football season has begun, these are not the reason for my annual September excitement. No, it because it’s harvest season in California wine country! Vines are full of beautiful ripe grape clusters, wineries are busy bringing in and processing them, and you can almost "feel" the excitement and anticipation for a new vintage! Drive through California wine country during harvest season and you will likely see giant lights set up in the vineyards at all hours of the night as crews carefully pick grapes during the cooler, less stressful evening hours. 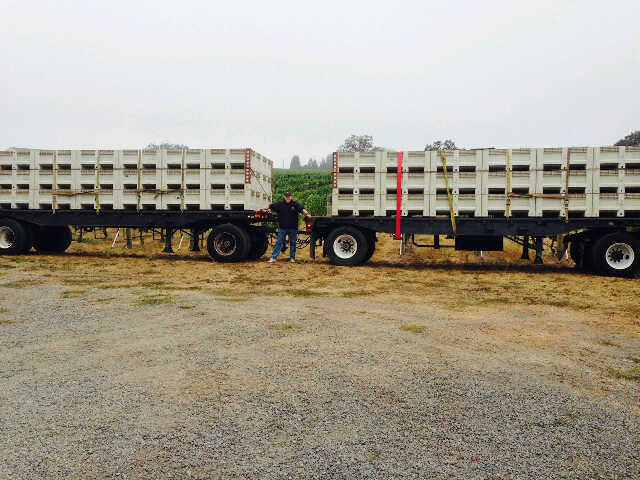 Also you will notice grape hauling trucks zooming through town to deliver their cargos to expecting wineries, and winery staff very busy sorting, pressing and processing grapes into this years new and delicious vintage. I am often asked "when is the best time to visit wine country"? Well the answer to that is simple. Anytime you can get there!! However, when I first began to visit wine countries over twenty-two years ago, I always wanted to arrive right as harvest season was beginning. To witness and feel a part of the energy, grape harvesting and crushing and all the other related activities, tasks and events revolving around harvest season was very exciting and inspiring to me! I love (and never get tired of it) seeing how wine is created and produced! However if you do plan a trip to wine country during harvest season, realize that winemakers and winery staffs are at their busiest and most stressful time of the year. So while visitors enjoy private tours, visits with the wine making team and extensive barrel tastings, these special activities may be difficult to organize and schedule during this very busy time. Each year harvest season excites and motivates me! Witnessing Mother Natures beautiful bounty, coupled with the talents and skills of outstanding grape growers and winemakers is always an honor and something I will always marvel at and truly enjoy. Like New Years Day, for me harvest season represents new beginnings, new challenges and new opportunities. It is a time of creative expression, tradition and teamwork. Today the 2013 harvest season has begun and is in full swing in California! Like the 2012 vintage, initial reports are great and 2013 looks to be another exciting and delicious vintage!! So this Fall while your enjoying a wonderful glass of wine on your patio or tailgating before your favorite football team takes the field, take a moment to remember and raise a glass to harvest season and all those grape growers and winery staff who take the risks and work so hard to create our wines, from grapes to glass! !